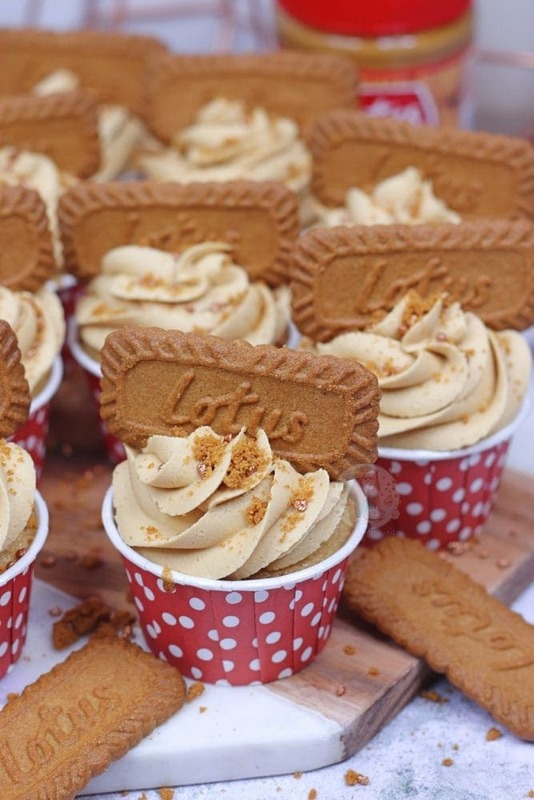 Easy and Delicious Vegan Biscoff Cupcakes with a Biscoff Centre, and Biscoff Vegan Buttercream! Let’s start this off in the best way possible… Biscoff Spread is Vegan. 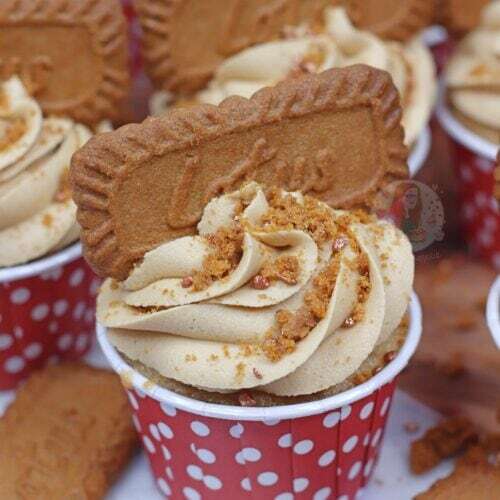 I know, I’m not the first person to realise this, but I’ve mentioned it to people in the past and on social media and a lot of you didn’t know this, so I thought a Vegan Biscoff Cupcakes recipe was the best way to go to show this information off. This is essentially entirely based on my Vegan Vanilla Cupcake Recipe because it was such a success, but with little bits altered here and there to get it to suit my Biscoff ideals. Such as, instead of using Caster Sugar, I used Dark Brown Sugar to get a much stronger caramel flavour in the cupcake sponge itself, whilst still being vegan! The thing about vegan baking, is often the colouring looks a little off, as the ingredients are different (obviously). If you change the sugar over, it really can make a big difference to the taste and the look! The glorious things about these cupcakes though, is that they taste INSANE. Like, honestly wouldn’t even know they were vegan kinda thing. 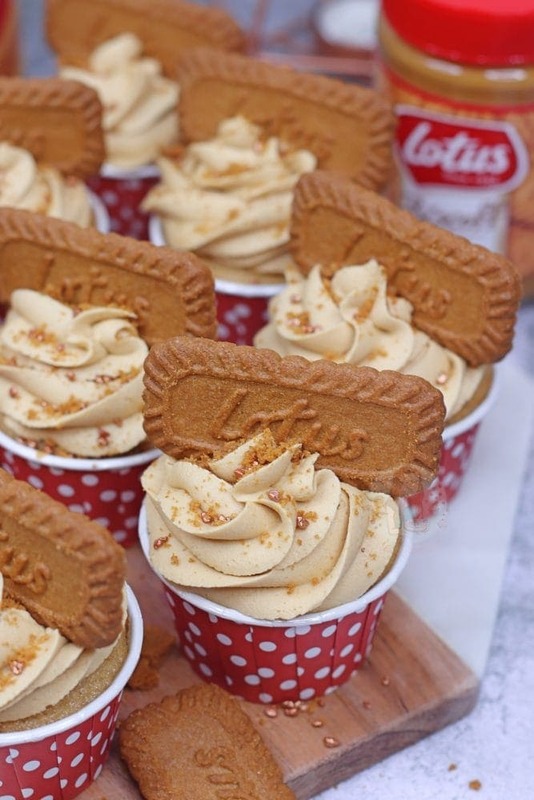 I wanted to make these as delicious as possible, so I added in a Biscoff centre to the cupcakes. I know some people would ask why I just didn’t add Biscoff Spread into the mix, but as the cupcake mix itself is so liquidy and smooth, I didn’t want to affect the bake itself. 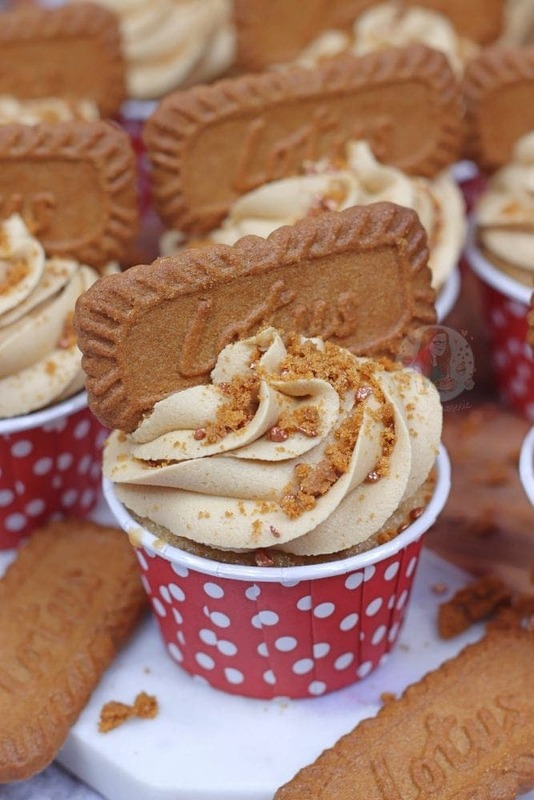 Coring out a smidge of the cupcake and adding in a teaspoon of Biscoff Spread is definitely the best alternative! 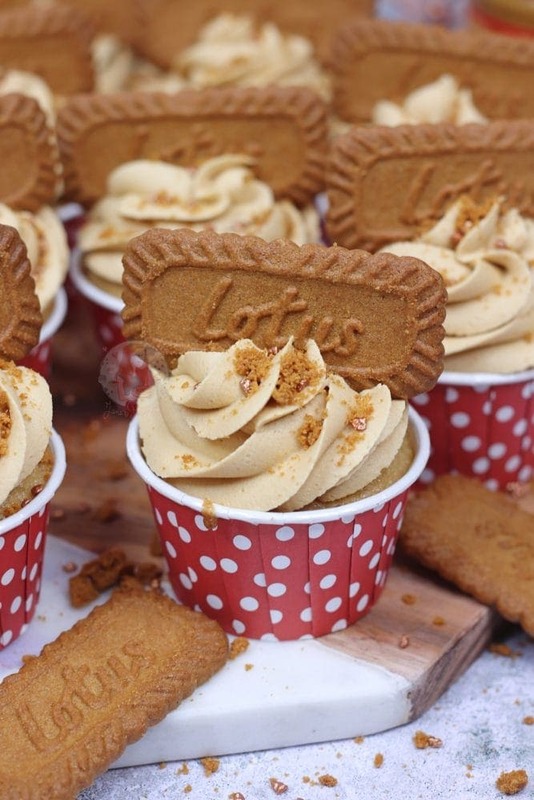 For the Vegan Biscoff Buttercream, it’s just so easy. You have to use a Dairy Free Spread (I use Vitalite) and then treat it as if it’s normal Buttercream! The key thing about using a Dairy Free Spread however, is that it’s naturally a lot softer than normal Butter, so won’t need any extra liquid added to it. Adding in the Biscoff itself is fine, as that’s so thick, but anything else? Steer clear! 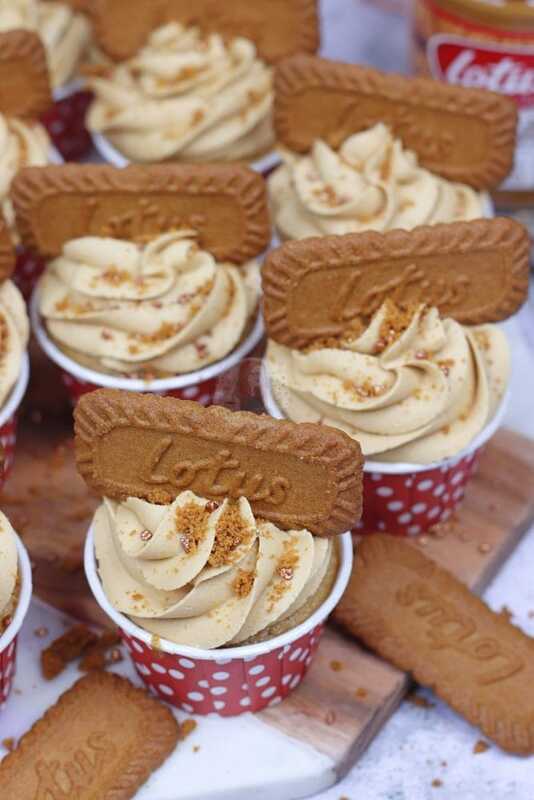 My Biscoff Cupcakes are one of my favourites on my blog, so I couldn’t resist making these look similar to them – so I added on a biscuit and some crumbs too. I realise the biscuits can often look a lil’ bit like fish fingers – but trust me they are worth the weird look. I did check, and the Biscuits are vegan too – so it’s all delicious and good. I tend to pipe my Buttercream onto cakes in only a few ways – one of those being with my Iced Jems Medium 2D Closed Star Piping tip. It makes the prettiest swirls, it’s so easy to use – and it’s so cheap! Jemma really does sell the best quality bits, for the best price. Along with the Piping Tip, I now ALWAYS use her Regular Baking Cups for my cupcakes – as they’re just so good. Preheat your oven to 180C/160C Fan, and get 12 large cupcake cases ready. I use the Iced Jems Regular Baking Cups! In a large bowl, whisk together your Flour and Sugar! Pour your Milk, Vanilla, Oil and Vinegar in and whisk till smooth! Split evenly between the 12 Cases, and bake in the oven for 20-22 minutes. 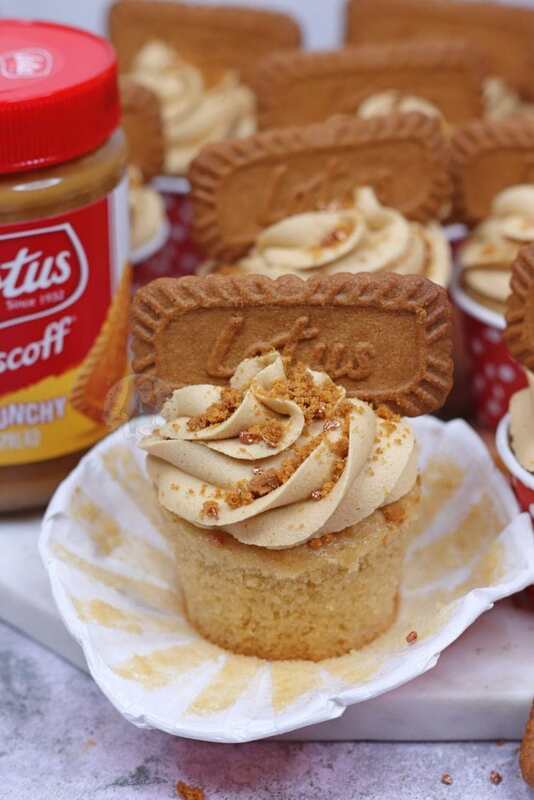 Core out the middle of the cupcakes, and add a spoonful of Biscoff Spread. In a large bowl, beat your Dairy Free Butter till smooth. Add in the Biscoff Spread and beat again! Add in the Icing Sugar and beat again till a lovely frosting is formed. 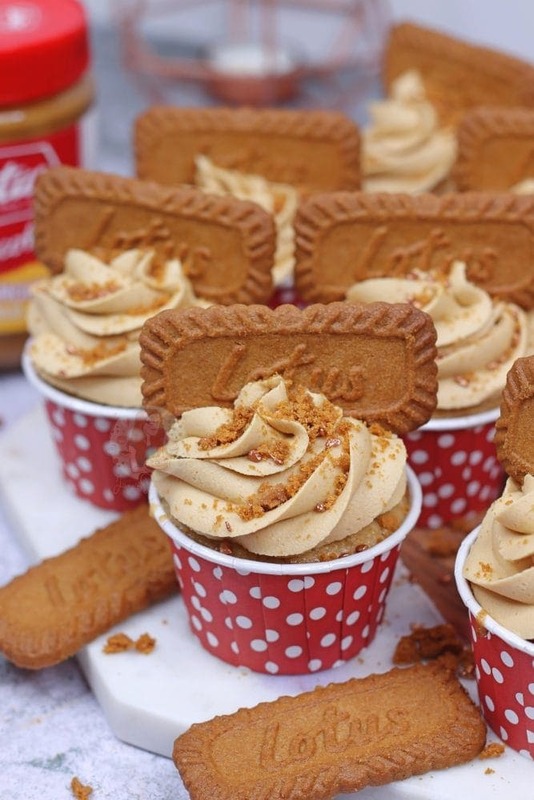 Pipe onto your Cupcakes - add on a Biscoff Biscuit, some crumbs and some sprinkles! I used Dark Brown Sugar in these, because I think they make a more delicious flavour as they are a vegan cupcake. Light Brown Sugar works just as well though! 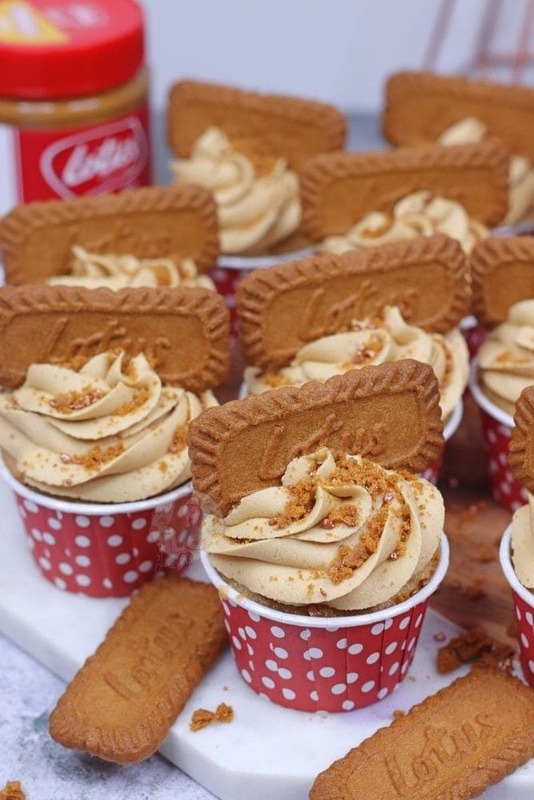 Yes, Biscoff Spread and Biscuits ARE vegan! If you have any Dairy Allergies, make sure to check ingredients first yourself. These will last 2-3 days once made! Don't add any extra liquid to the Buttercream as Dairy Free Butter is a lot slacker than usual Butter! Older Next post: Bourbon Biscuit Cheesecake! Newer Previous post: Slutty Brownies! 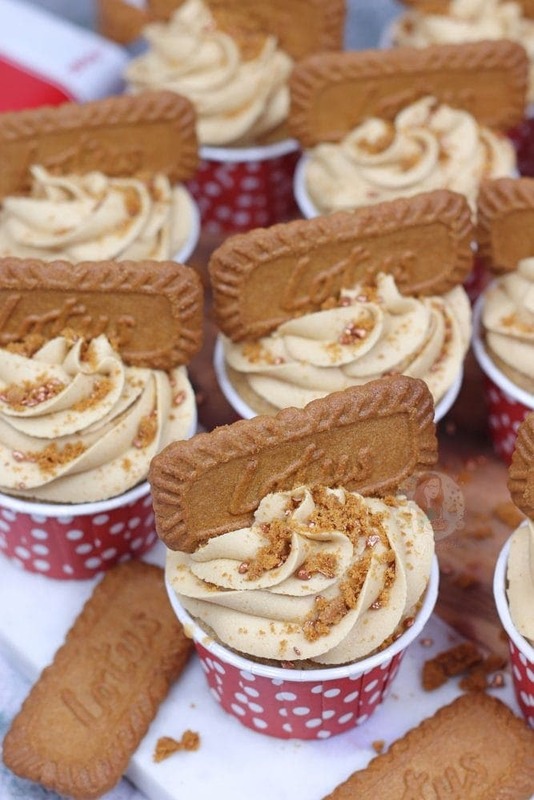 Hi Jane, can these Biscoff cupcakes be made with ordinary dairy butter or does the recipe work better if you use dairy free. I’m not a vegan so was just wondering. Jane would this recipe work as a two layer sponge cake too? I believe so, each batch is one layer of a cake!